Which look do you like best for beautiful Barbie doll, Princess or Pop star? Barbie can't decide either so she's going to try both styles in order to make up her mind! Can you makeover Barbie in both styles? Start with the makeup first. Try the soft pink eye shadow color, an extra long eye lashes black mascara, a pink blush and a rose red color for the lipstick to complete a flawless make up. Continue with the dressing up and for the princess look. You can go for the glam pink dress with the cute little bow in the waist, matching high heeled sandals with sparkly gems and complete her royal look with a tiara decorated with red rubies. Now it's time to try the pop star look on gorgeous Barbie. Try a super cute glitzy black mini dress, a purple pair of glitzy boots to match her red-purple hair color and complete the look with a great electric guitar and microphone! At the end you get to see both styles next to each other and it'a up to you to take the final decision! But I am sure that Barbie loves both of them equally! 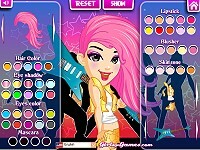 Have an amazing time playing this awesome new free online flash Barbie makeover, make up & dress up game for girls here in Minigames.com! 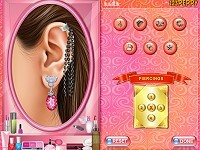 Use your mouse to makeover, make up & dress up Barbie as a Princess and a Pop star.